Once each year, the grotesque Bergens–miserable creatures who don’t know how to sing or dance–feast on the fun-loving Trolls. The reason? Eating a Troll is the only way that a Bergen can experience happiness. But the Trolls fled their homeland many years ago, and the care-free Princess Poppy is convinced that the Bergens are no longer a threat, despite the constant warnings of Branch, the grouchiest Troll of them all. Unfortunately, Branch turns out to be right, and when the evil Bergen Chef kidnaps several of her friends, she enlists him to join her on a quest to save them before they all become snacks. Of all of the projects that DreamWorks Animation has announced over the years, Trolls was probably the one that was met with the most head scratches. 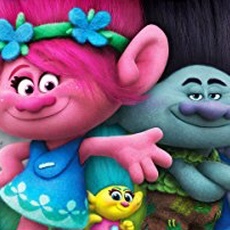 The franchise–if we can even call it that–had been mostly dead for quite a few years, following an extremely short-lived TV series in 2005 that re-imagined the Trolls as teenage girls in high school (Jeez, DIC Entertainment has made some pretty silly stuff, haven’t they?). For the most part, Trolls has really only ever been successful as a toy line, one that was at its most popular in the late 80’s and early 90’s (although I only remember having one of them as a kid, which I got as a favor at a birthday party), so it’s a bit curious that the studio behind acclaimed hits like Shrek and How to Train Your Dragon has chosen now to make a major motion picture about them. Perhaps because of this, I have a hunch that Trolls could end up having a “love it or hate it” reaction from certain audiences. The very reasons that fans like the film will be the very same reasons that others are unable to stand it, depending on what their personal tastes on tiny woodland dolls with colorful Afros singing pop songs are. But the movie has an ace up its sleeve: it’s aware it might be kind of annoying, and it’s willing to make fun of that in order for you to enjoy it. But, more importantly, it also doesn’t care. 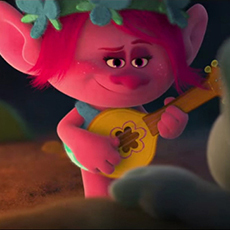 Trolls is unabashedly, almost defiantly non-cynical, a film in which all of the characters–with the exception of the villains–are ultimately sympathetic. Even the supposedly nasty Bergens, who wish to gobble up the film’s heroes, are only doing so because they want to be happy. All of this may be why, at the end of the day, Trolls won me over. While no one is going to proclaim it an instant classic like Frozen or Inside Out, it succeeds at what it’s trying to do, and it probably works to the film’s advantage that many are going to walk into the theater with at least somewhat low expectations for it. Trolls is the cinematic equivalent of candy: not particularly meaty or filling, but still satisfying to consume. One of the keys to the movie’s appeal is its use of music. 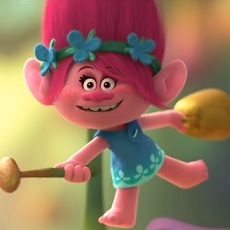 Comparisons to Strange Magic are inevitable, I suppose (well, at least among those who know what Strange Magic even is), but Trolls is probably more comparable to the underrated Gnomeo & Juliet in terms of its soundtrack. The film has a variety of tunes both original and classic, and for the most part they’re pretty great, although I at least was frustrated that the majority of songs in the second act last roughly a minute each. 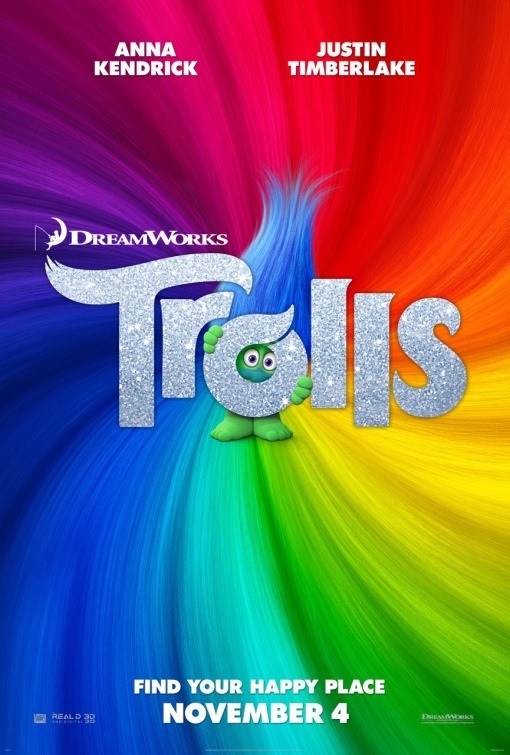 Fortunately, Trolls has at least four showstopping musical numbers spread throughout its running time of an hour and a half, climaxing with a rousing grand finale featuring a certain Justin Timberlake song you’ve possibly heard on the radio by now. Speaking of Timberlake, it’s nice to see him in a DreamWorks film in which he’s not woefully miscast as he was in Shrek the Third. As Branch, he’s able to play to his strengths as a Troll who’s almost always sarcastic, and works as a nice contrast to Anna Kendrick, who’s terrific as the consistently cheerful but also genuinely caring Princess Poppy. The real surprise of the cast, though, is Zooey Deschanel, who’s almost unrecognizable as Bridget, a lovesick Bergen who I suspect will be many people’s favorite character. The rest of the voice actors–including Christopher Mintz-Plasse, Christine Baranski, and Russell Brand–all do fine work, even if John Cleese and Jeffery Tambor are essentially doing glorified cameos. As is usually the case with DreamWorks, the animation is great. Produced in the widescreen format, Trolls looks like a giant coloring book, with its lush landscapes practically bursting off the screen, even when seen in 2D. The world of the Bergens, meanwhile, almost resembles a Gothic fairy tale, filled with twisted village buildings and castle towers which bring to mind the bleaker work of Don Bluth (especially, oddly enough, certain scenes from A Troll in Central Park). The Trolls themselves are also simple but pretty cool creations, resembling the toys just enough while still looking like original characters. Trolls is zippy, fun, and easy to like, even if it is a comedy that may earn more chuckles than big laughs. While it won’t be everyone’s cup of tea (if you’ve found the film’s trailers obnoxious, you might want to steer clear! ), if you’re willing to go along with its simple charms, you should be able to leave the theater with a smile on your face. And that’s good enough for me.